Stephen III of Bavaria-Ingolstadt (1337–September 26, 1413, Niederschönfeld). Frederick of Bavaria-Landshut (1339–December 4, 1393, Budweis). 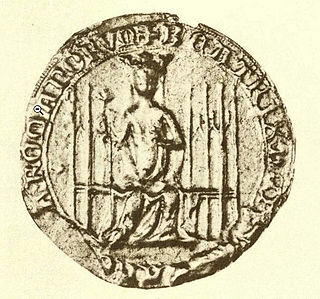 John II of Bavaria-Munich (1341–1397). Agnes (b. 1338), married c. 1356 King James I of Cyprus. Two of their sons became Duke of Bavaria and their daughter, Agnes became Queen of Cyprus by her marriage to James I of Cyprus. Her granddaughter and namesake was Isabeau of Bavaria, queen of France by her marriage to Charles VI of France. Isabeau's children included: Isabella, Queen of England; Catherine, also queen of England; Michelle, duchess of Burgundy and Charles VII of France. Elisabeth died in 1349, her husband later married Margarete of Nuremberg; they had no children. Frederick II was the regent and subsequent King of Sicily from 1295 until his death. He was the third son of Peter III of Aragon and served in the War of the Sicilian Vespers on behalf of his father and brothers, Alfonso ΙΙΙ and James ΙΙ. He was confirmed as King of Trinacria by the Peace of Caltabellotta in 1302. His reign saw important constitutional reforms: the Constitutiones regales, Capitula alia, and Ordinationes generales. Stephen II was Duke of Bavaria from 1347 until his death. He was the second son of Emperor Louis IV the Bavarian by his first wife Beatrice of Silesia and a member of the Wittelsbach dynasty. 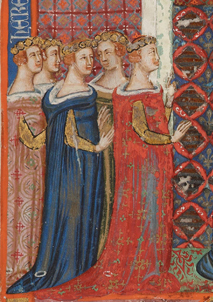 Eleanor of Anjou was the Queen consort of Frederick III of Sicily. She was a member of the Capetian House of Anjou by birth. Beatrice of Silesia was a Polish princess member of the House of Piast in the Silesian branch of Jawor-Świdnica and by marriage Duchess of Bavaria and German Queen. Ludmilla of Bohemia was a daughter of Frederick, Duke of Bohemia, and his wife, Elizabeth of Hungary. Ludmilla was a member of the Přemyslid dynasty. She was Duchess consort of Bavaria by her marriage to Louis I, Duke of Bavaria. Antonia Visconti was a daughter of Bernabò Visconti and his wife Beatrice Regina della Scala. Antonia was Countess of Württemberg by her marriage. Catherine of Austria was the oldest daughter of Leopold I, Duke of Austria and his wife Catherine of Savoy. She was a member of the House of Habsburg by birth and married the Lord of Coucy.